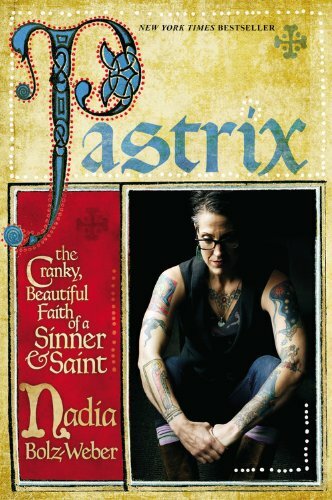 I’ve started reading through Pastrix: The Cranky Beautiful Faith of a Sinner & Saint by Nadia Bolz-Weber, who is a Lutheran Pastor. After hearing the author speak once and knowing something of her story, I was intrigued when this book came out. One I started reading the book and learned that she was raised in a Church of Christ, it makes even more sense why I find her story intriguing. Now a word of warning to those with super-disdain for foul language… you are warned. The author is just like us all, a sinner in need of God’s grace. I lament that she didn’t learn about the grace of God in a Church of Christ but I understand. I only hope that as preacher in a Church of Christ, those who hear me preach and teach will learn of God’s grace because we’re all hopeless without it. Grace is when God is a source of wholeness, which makes up for my failings. My failings hurt me and others and even the planet, and God’s grace to me is that my brokenness is not the final word. My selfishness is not the end-all… instead, it’s that God makes beautiful things out of even my own s***. Grace isn’t about God creating humans as flawed beings and then acting all hurt when we inevitably fail and then stepping in like the hero to grant us grace—like saying “Oh, it’s OK, I’ll be a good guy and forgive you.” It’s God saying, “I love the world too much to let your sin define you and be the final word. I am a God who makes all things new.” (p. 48). Feast on that over the weekend. Let the grace of God be a balm to our soul. Let it transform us, forgetting the past and striving for what lies ahead (cf. Phil 3:13) to the glory of God! This entry was posted in Churches of Christ, Faith, Hope. Bookmark the permalink. As one who grew up in the Church of Christ I can look back and easily see how we were not allowed to be sinners, failures, broken vessels. Oh, we most certainly were; just now “allowed”. Services, pew, pulpit and Bible classes were a stage. I think that is the problem with what the non-churched see of the church. I often hear from church members how the “world” ridicules Christians. That is sometimes the case. But what most people outside the church often ridicule is the pretense of church members in being more than human, the audacity to say, “Pay no attention to what we are; just listen to what we say we are”. I feel assured that Ms Bolz-Weber will be a light to many outside of the church walls, as well as for those inside the church who cannot pretend any longer. Of course, there will always be a segment of churches and members who will be aghast at someone like her. But one thing I have seen in my sixty something years on this earth, is that when the good news of Jesus starts being read and studied afresh through the human factor with integrity, it does not waste energy in trying roll over those who will not move; it just gently goes around. Grace will always be offensive to the self-righteous who think they don’t have any need, or as much of a need, for it. Regrettably, at one time I was among the self-righteous. Oh, I was of the self-righteous also. I thought I was standing so straight, and all I kept doing was falling over backwards. In fact, I have to confess that at times, too many times, I was nothing but an insensitive hypocrite. I am just as truthful about myself as I am of others in my past; I have to be…God is more real to me now than God was then. I have to show more mercy to others than I reserve for myself. That is not a boast; it is my goal. As in other areas, i fail in that regard also. But at least now when I fall, I fall forward. Facing the direction I need to go when I get up. I must add that her homilies are quite beneficial. She “gets it” given her past which included substance abuse. I think too many times the person refusing grace to others has either never needed it (has been very fortunate) or thinks that only certain people who are really virtuous are worthy of it.